Last weekend once the vast majority of the snow had melted I needed to get out of the house. Since returning from Thailand and Cambodia I had only gone out into the winter-wonderland that was Seattle to trudge up to the pharmacy to pick up the antibiotics to kill whatever bacteria we had picked up while traveling. I did not realize how cabin-fever-ish I had been getting until I got out. I ventured out to Lowes to pick up a few things for the house — none of which they had. So on my way back, not quite ready to head home yet, I figured I would stop off at Goodwill. 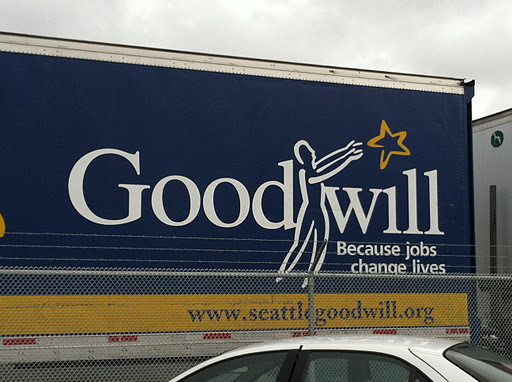 I had not been to the GIANT Seattle Goodwill other than to drop some stuff off soon after I moved into town. I had visited a few of the the other smaller branches, but they had not really impressed me all that much, so I was not really sure what I would expect. Truly, the place was overwhelmingly large. I could not even dive into the clothing sections of the store because there was just too much and there were way too many people there. Still, I wandered around the edges of the place to see what they had to offer. I did not even see that there was a back room initially. 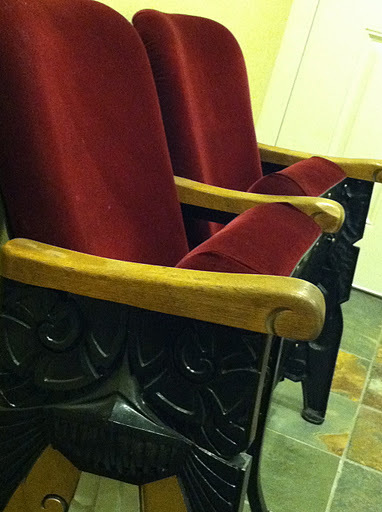 For a while I had been looking for something to compliment a set of chairs we picked up for our entry way. 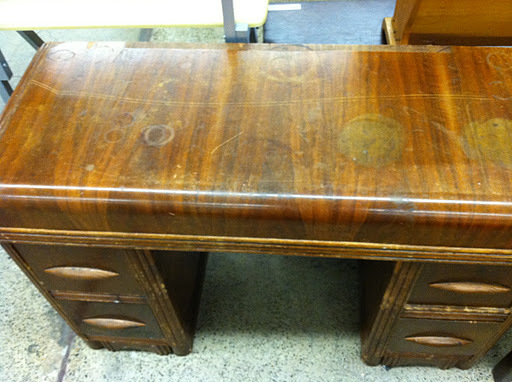 The old sewing machine table that I had down there was functioning as landing area, but it was not all that useful. It provided a surface, but that was pretty much all it did. In my old apartment I had a lovely low-boy dresser with big, deep drawers that held all of my scarves, hats, and mittens as well as other small things. It also gave me a great big surface for placing things when I entered the house. Doubling the number of people in a household and halving the landing area for the entry way just was not working out for us. 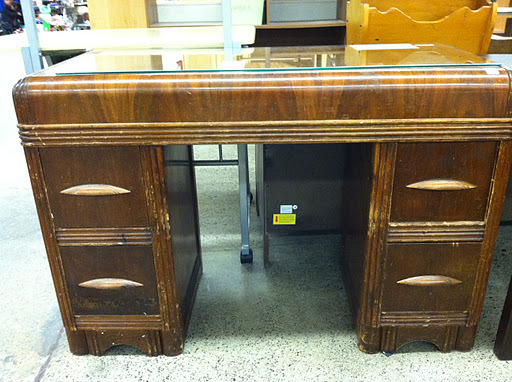 But after four months I had kinda given up on scouring craigslist for the perfect sideboard or console table. 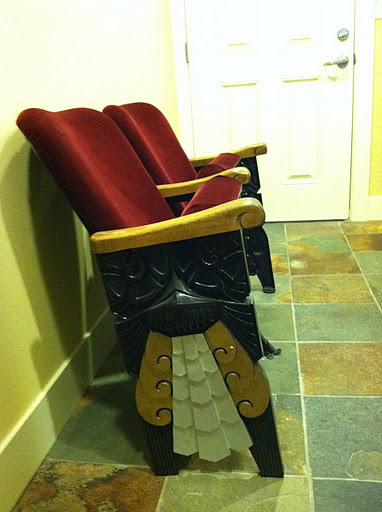 When I came across the waterfall vanity I fell in love with it immediately and knew that it would compliment the beautiful, old, art-deco theatre seats perfectly. Aren’t they awesome? I took a picture of a the vanity and sent it to Partner on a lark. I did not think he would agree to the piece. And certainly not without seeing it and discussing it. But then again, I did also send him the price $29.99 (!!!) Yes, the piece needs work, but OMG that is a serious steal! He texted me back telling me to buy the vanity then and there. Now, if only I can find I Bertoia chair for that price….